Since the beginning of 2014, the rouble has lost around 30 percent of its value in relation to the dollar. According to analysts, the main reason for the devaluation of the currency is the continuing decline in oil prices. “Currently, the key factors contributing to the weakening of the Russian currency are the decline in oil prices and other raw assets,” says Anton Soroko, an analyst at investment holding Finam. On November 13, the price of Brent crude fell below $78 per barrel, even though in midsummer quotes were about $115. According to Soroko, this process is occurring against the backdrop of the dollar's aggressive growth not only in relation to the rouble, but also to the yen, the Swiss franc, the euro and other currencies. “The dollar's growth first and foremost reflects the shortage of the currency on the market, which is due to the increase in demand,” says Mikhail Khromov, scientific collaborator at the Centre of Structural Research of the Russian Academy Institute of Applied Economic Research. According to Khromov, the second factor influencing the rouble is that, due to the sanctions on Russia and geopolitical instability, the country has no foreign capital inflow. In response to the decline in the rouble's value, Russia’s Central Bank carried out a series of currency interventions at the beginning of October. To reduce demand for foreign currency, the regulator began selling dollars in order to support the rouble's value. In October 2014 the Central Bank spent almost $29.3 billion supporting the rouble and in the course of nine days beginning at the end of October it sold more than $2 billion a day. “This way the regulator only smoothened out the market fluctuations, but did not try to stop the current descending trend in the Russian currency,” asserts UFS IC's chief analyst Alexei Kozlov. However, the large-scale intervention did not produce results and on Nov. 7 the Central Bank decided to let the rouble float freely. It was initially assumed that the Russian rouble would switch to a complete free float, however, in view of the pressure on the national currency the Central Bank decided to accelerate the process. According to the new strategy, the Bank of Russia will not carry out full-scale currency interventions, that is, selling dollars on the Russian market. The maximum value of a Central Bank sale will be $350 million a day, which, analysts say, will not affect exchange rates. The Central Bank's press office explains that refusing unlimited currency interventions will deter speculators from betting against the rouble. The decision has led to a dramatic change in the exchange rate: In the course of trading on November 8 the rouble simultaneously fell by about 10 percent to the dollar before rebounding and practically cancelling out the decrease. 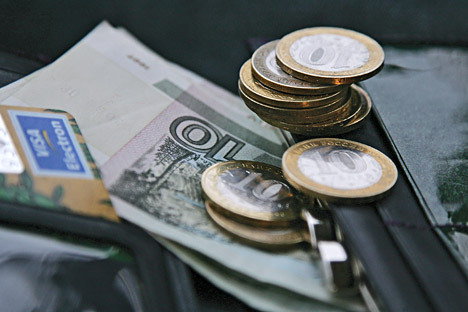 “The Central Bank's decision falls into the strategy of switching to inflation targeting, a part of which is the free float of the national currency,” explains Dmitry Bedenkov, director of the analysis department at Russ-Invest. At the same time, Bedenkov says that the Central Bank has reserved the right to intervene with more than the $350 million announced if it senses a threat to the rouble's stability. The establishment of daily intervention limits on the borders of currency corridors is intended to lower the pressure on Russia’s gold reserves, adds Bedenkov. The weakening of the rouble is also advantageous for the Russian government, since it leads to the reduction of a possible budget deficit. According to Anton Soroko, the fall of the rouble has a positive effect on the budget, since it helps compensate for the fall in revenues of oil and gas sales. The lion’s share of hydrocarbons is sold in dollars and euros, while the Russian budget is drafted in roubles. The weakened rouble also places the Russian manufacturer in an advantageous position since the value of imports increases, thus helping Russian producers to compete more successfully with their foreign counterparts. Mikhail Khromov dismisses widespread fears that the low price of Brent will leave a hole in the Russian budget, which currently requires an oil price of just under $100 a barrel to avoid a deficit. “The average annualized price of oil remains above $96 per barrel (the Russian budget is based on this price) since in August the price of oil was $106, and even if oil will cost $85 until the end of the year, the average annualized price will still be about $100, which does not pose any risks for the budget,” he says.